Here is a simple, lace textured slab built pot decorated with my own screen printed ceramic decals of my grandmother’s handwriting and finished off with a bright gold lustre. I have made the pot to commemorate my grandparents’ 65th wedding anniversary, commonly known as a ‘sky blue anniversary’. A bit of a rarity I am certain! It plays on the bridal tradition of something old, something new, something borrowed, something blue. 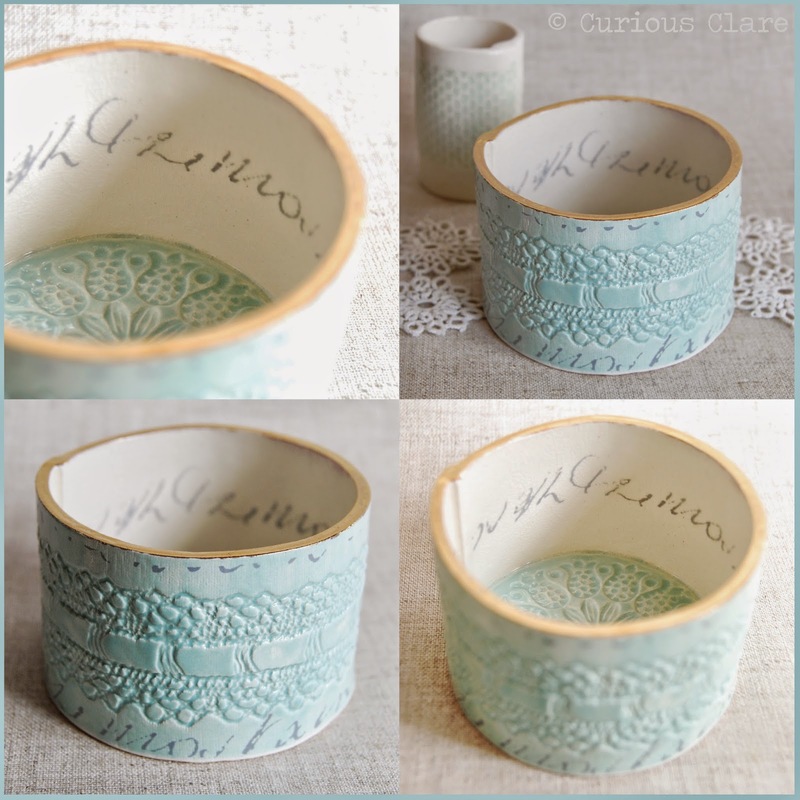 In this case the old is the garter lace, the new is the pot, the borrowed is the handwriting and the blue is the glaze itself (and one of my grandmother’s favourite colours). 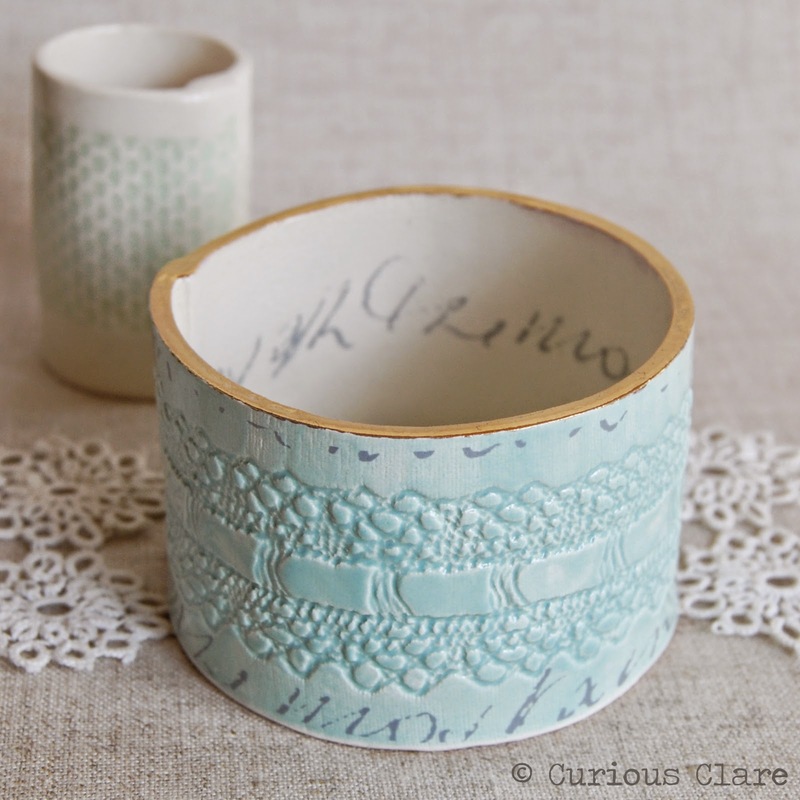 I chose the garter lace to imprint into the surface of the clay as it is symbolic of weddings and my grandmother used to demonstrate the making of lace at Nottingham Lace Market several years ago. Her handwriting is not meant to be read but to be appreciated for its beautiful flowing forms. I have cut up and rearranged the text on the outside of the pot so it takes on a wholly decorative purpose. Let’s hope they like it. Although, I suspect my grandmother will be much more excited by their congratulatory card from the Queen!